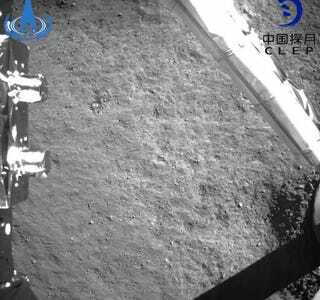 At 10:22 p.m. Beijing time Thursday January 3, China’s Jade Rabbit 2 rover touched the Moon’s soft, snow-like surface after slowly rolling down a track extending from the Chang’e 4 lander, according to state broadcaster CCTV, and as relayed by the Associated Press. The rover was deployed about 10 hours after the Chang’e 4 spacecraft landed on the Moon. 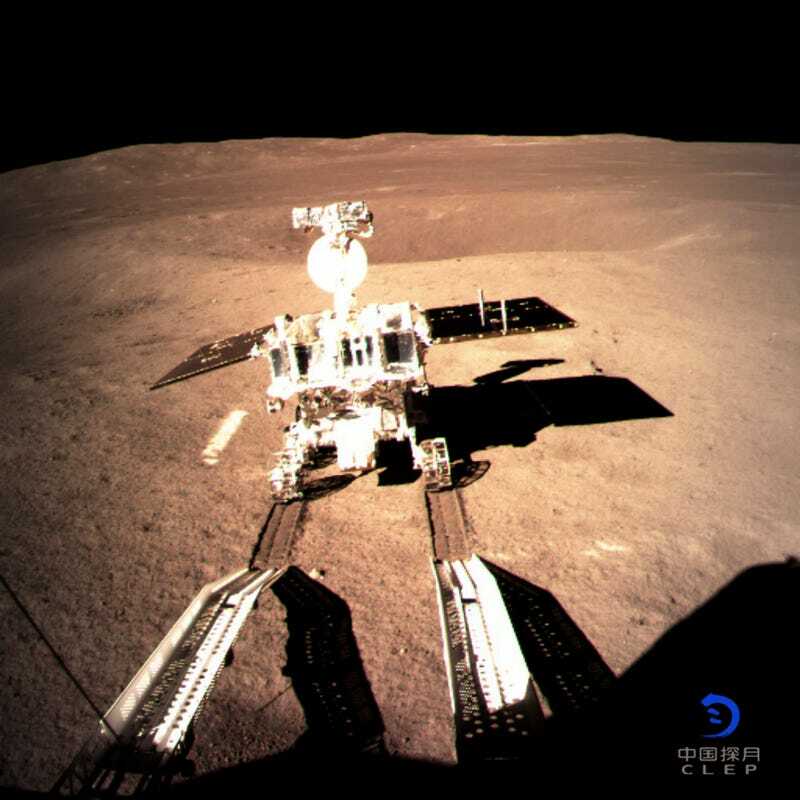 It’s now the first time in history that a mobile probe is active on the far side of the Moon—a huge accomplishment for the China National Space Administration (CNSA) and the nation’s burgeoning space programme. Bombastic words, to be sure, but the true meaning of this statement is likely lost in translation; by “conquering” the universe, Wu is likely speaking of humanity’s growing mastery over nature, and not some kind of plan to assemble a galactic-scale empire. At least we hope. A photograph taken by the Chang’e 4 lander shows the six-wheeled rover sitting pretty on the lunar surface with a pair of track marks trailing behind it. Directly in front lies an ominous hole, almost certainly a crater. This image, along with others taken soon after the landing, are the first close-up images ever taken of the Moon’s so-called far side. We call it that because it’s the side that never faces Earth. Our Moon is tidally locked, which means one side is perpetually facing our planet. It’s a misnomer to call it the “dark side” of the Moon, as the Sun’s rays also reach the Moon’s outward-facing side. Back in 2013, China deployed its Yutu rover, or Jade Rabbit 1, on the Moon’s near side as part of the Chang’e 3 mission. It was the first soft landing of a probe on the Moon since the Soviet Lunokhod 2 mission of 1973, but the Yutu rover lost its ability to move after just two lunar nights. Together with the Chang’e 4 lander, Jade Rabbit 2 will collect scientific data to help scientists learn more about the early conditions of the Solar System, to sniff out the potential presence of water ice, study the relationship between solar winds and the Moon’s surface, and study low-gravity plant growth, among other scientific goals, according to CNN. Another cool thing about this mission, as pointed out by AP, is that the CNSA used a innovative technology in which the Chang’e 4 spacecraft autonomously scanned the surface of the Moon prior to landing, selecting the safest possible spot to land. That’s never been done before. In addition to gathering precious scientific data, China is also doing some reconnaissance and developing the technologies required for a crewed mission to the Moon. Beijing has made it known that it would like to eventually build a base on the lunar surface.